March Mayhem: Developers' Showdown has begun and your favorite developers are looking for your support. Each time you vote you receive an extra entry towards the Grand Prize, an Alienware M15x Gaming Laptop! It is that time of year again! You, the community, and gaming communities from around the world will vote for your favorite developers to see who is the final one standing. 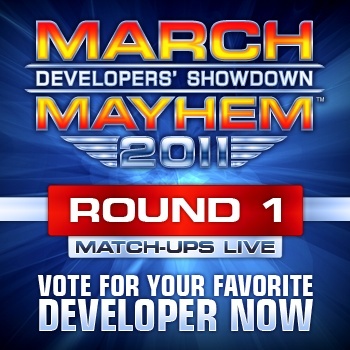 March Mayhem: Developers' Showdown Round 1 is now live and your favorite developers are waiting for your votes. Each time you vote, you gain an entry towards one of the amazing Alienware gaming laptops, including the Grand Prize, a M15x! Make sure to Tweet after each vote for an extra vote for your developer of choice AND an additional entry towards the prizes. Each round is open for 48 hours, so get those votes in! To begin voting, head over to the Official March Mayhem: Developers' Showdown bracket by clicking here. Good luck! For all of the rules and how to participate, please visit our rules page here.